Student To Do ListThe Student Planner will help students prioritize what they need to do across courses, identify missed opportunities, and add their own items to their list of to-dos to help them manage their time in one place. How Do I Use the Dashboard List View as a Student? Module DuplicationPreviously, course content items could only be duplicated individually. With the recent Modules update, instructors can duplicate entire modules. If your module has a quiz in it the module cannot be duplicated. How Do I Duplicate a Module? Section Specific AnnouncementsInstructors can now create section-specific announcements in their courses. When creating an announcement, instructors can select to send the announcement to all sections, one section, or multiple sections. How Do I Create a Section-Specific Announcement? Section Specific DiscussionsInstructors now have the ability to invite specific sections to view and participate in a discussion so it can be focused to the right audience. The people tab. All students who have ever enrolled in the course will always display here so this will make the list longer than it has in the past. This first semester is an introduction to this method and you may receive calls for support about the inactive tag showing up in the people tab or instructors wanting information about dropped students. See https://ep.maricopa.edu/ERP/canvas/Pages/Last-Day-of-Attendance-Changes-Fall-2018.aspx to see the offical MCCCD statement about this change. Stacking Replies in DocviewerWhen users view comments for a DocViewer-supported document, comments with replies are stacked together. The number of replies is indicated for the comment thread. Users can click the first comment to expand and view all additional comments. Badgr is the official Canvas badging solution supported by Instructure. Look for special communication about using Badges in your Canvas courses. Join Turnitin® their third annual Student Success Week October 5-9. SSW15 is a five day virtual conference. This year the sessions will focus on “how technology affects writing instruction and the student learning experience”. Participants will learn techniques and strategies for using digital tools to increase student engagement and improve writing skills. Certificates of Participation are provided for registered participants! Turnitin® is a service that is used by thousands of institutions in over 80 countries. It has a range of options, but the primary tool is its Plagiarism Prevention component, which has been purchased by MCCCD. Turnitin® is integrated with Canvas making it easy for you check for plagiarism in work submitted by students within Canvas. Learn more about using Turnitin® at MCC. This FREE series will kick off on Monday, October 5, and will include 45-minute webcasts. Register for one or all 8 sessions! Can’t make these times? Register and they will send you the links to the recordings! Visit the SSW15 home page. For more information, please visit the Student Success Week 2015 website. Spring 2014 and older SIS courses (courses with a designated section number) will begin being deleted on October 2. Deletion (Archiving) will start with Summer 2012 and Fall 2012 MCC courses. All course materials and student information associated with those courses will be deleted. These courses will also no longer appear in your course menu, inbox or calendar list. Throughout the Fall additional deletion/archiving processes will be run for the Spring 2013-Spring 2014 semesters. Please create archives of the courses if you think you want to keep/reuse any of the content. The archive (export file) can be imported into another Canvas course at a later time. Note: A course export does not include student records. You or your students may have noticed a recent disclaimer in Canvas regarding learning tools, known as LTIs (Learning Tools Interoperatbility) in Canvas. LTIs are a specific type of tool that may route users or their data to another resource (vendor). They include tools such as communication apps (e.g., “Chat”), to entire learning environments (e.g., Pearson MyLabs), and utilities such as plagiarism detection resources (e.g., TurnItIn). Although these tools are designed to enhance the learning experience, you should be aware that when you or your students use these links, you are potentially leaving the Canvas environment and the protections MCCCD has built-in to assure alignment with Maricopa’s Data Privacy and Security Standards and other legal compliance. At present, MCCCD has been unable to verify that the LTI software and systems conform to Maricopa standards for privacy and security. There is, therefore, some risk that individuals electing to use the products and services made available by these LTI vendors may place any student information shared with the vendor at a risk of disclosure that would concern MCCCD. A District-wide committee is being established to address LTI concerns and one of the committee’s first activities may include building a web page that contains additional information about LTIs. Additional announcements will be made to include the address of the informative web page when it becomes available for your use. For now, there are no specific recommendations. However, you may consider carefully reviewing any LTIs that you are using and informing students of the use of these tools in your course (e.g. syllabus). Canvas is on a 3-week update-release cycle. The next beta (preview) release is on 9/28, production notes will follow on 10/5 with the release and documentation to follow on 10/10. Follow the release schedule on the Canvas Updates Calendar. When creating a course event, the calendar feature now includes a recurring option similar to that of Google Calendar. Instructors can choose to create copies of the event to occur every day, week, or month. This course-level feature is pending an MCCCD release, but should be available soon. Learn more about the Canvas Calendar. Learn more about adding recurring events. To create course events that repeat throughout the semester. When an event is scheduled to recur it will create a copy for each instance or occurrence. Recurring events are not linked together. They are copies or independent events. If users need to modify an event, each event has to be adjusted individually. Big Blue Button just got bigger! The Canvas Conferences feature, Big Blue Button, has been outfitted with a polling feature. Now a presenter in a web-based conference in Canvas can survey, assess and engage participants with a quick poll. Polling options include Yes/No, True/False, or letter responses (A through F). Learn more about the Canvas Conferences feature. Learn more about the polling options. 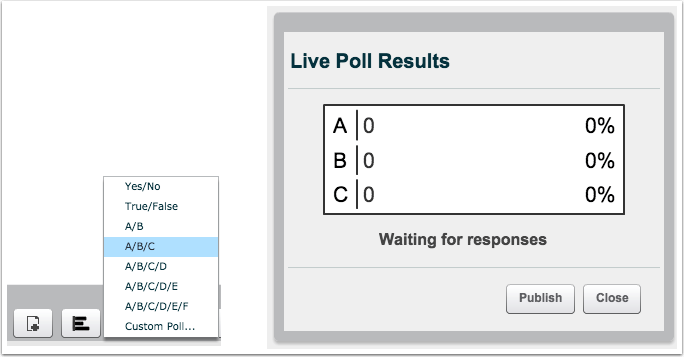 To create an interactive poll during a web-based presentation in Canvas. Presenters (faculty or students designated as presenters) can create a poll at the bottom of the presentation window. Polls can also be created automatically from a slide in a presentation document that asks a poll type question. The feature will read the slide and include polling options that match the question! Polls are always anonymous and they are not required. Once a poll is started, presenters can see the participant responses as they are made in real time. The presenter an publish the results of a poll during the web conference. Groups (student or instructor created) will now conclude when the course does. Groups in a concluded course will not appear in the Courses & Groups menu. 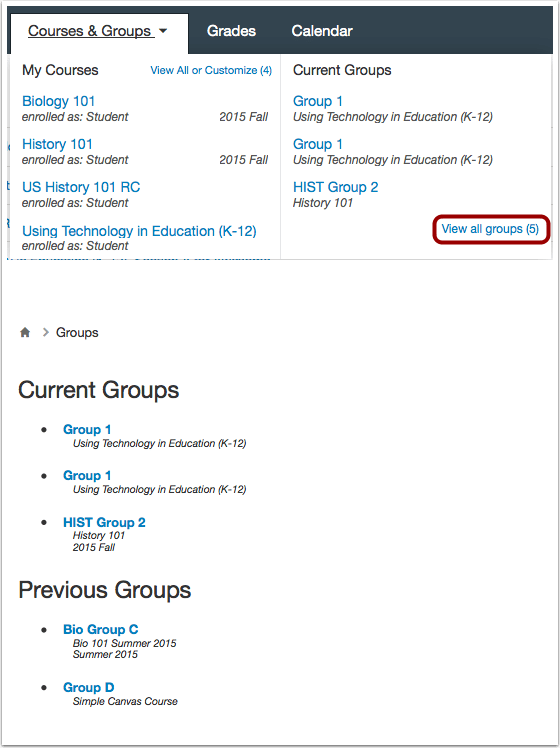 Users will still be able access their previous and current groups in the Groups index page available in the Courses & Groups menu. Learn more about concluding courses in the End of Course FAQs. Learn more about the Group feature in Canvas. When an instructor mutes an assignment, scores are muted from (or not calculated in) the student’s Total score. Previously muting also prevented instructors from seeing the actual total. The instructor’s Gradebook will now reflect the total score with the muted assignment value included. Learn more about assignment muting. Global Announcements in Canvas have a new face. A clear box and distinguishing color with icons make it easier for users to see important notifications on the dashboard. Review the latest improvements to the iOS and Android Canvas Apps. Review the Release Notes for more updates & bug fixes. Canvas will be introducing a new User Interface, product look and feel, beginning in August of 2016. The new interface will be a big change for both faculty and students. This new interface will streamline navigation and refine the user experience. You can learn more about the new UI by watching this video and reading this Canvas Guide. Be prepared for an exciting change! You can see how the new UI will operate by visiting the MCCCD Canvas Beta environment. This environment is used to review upcoming changes. Note: This is not a live production environment, it is for review of features only. Log-in with your MEID and MEID password and take a tour! Why wait? I love it! The interface has been launched in certain instances of Canvas, the Network and Free for Teachers, but is not available in MCCCD at this time. Extensive testing and feedback is needed to make sure that the new UI will be a good fit for our teaching and learning environment and to address any specific issues that may cause disruptions. The expected date that the new UI will be available in MCCCD is August 2016. I think something could be better! Great! If you are interested in providing feedback to Canvas about the new UI, they have formed a community where people can share their accolades, concerns and ideas. Join the New UI User Group to see what people are saying and start sharing your thoughts about the new UI. New UI Frequently Asked Questions can be found on the Canvas Community site. Watch the upcoming CanvasLive Webinar on September 23, Same U-New UI live or access the archive after the session at a more convenient time. Contact the MCC Center for Teaching & Learning for more information about this or other Canvas issues. The CTL is your partner as you implement innovative teaching, learning and workplace strategies. From general support, to consultation services, and/or tailored workshops, we are here to help you, your department, program or team reach your goals for student success. 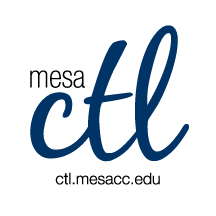 The CTL provides day-to-day support for faculty and staff on technology, teaching and productivity issues including Canvas. Stop by our offices, send us an email or give us a call for support or to set-up an appointment. We are here for you! View our learning opportunity calendar. Visit us on the web at ctl.mesacc.edu. Canvas Instructor Orientation is an open enrollment course that will walk you through the basics of setting up a new course in Canvas. To enroll, simply click on the “Join this course” button on the Course Home Page. There is no facilitator, but it is a good series of self-paced exercises. Canvas Instructor Video Guides contain quick and informative video tutorials to get you started with Canvas. Canvas Guides are available that cover all major features of Canvas. They can be searched by topic (e.g. Assignments, Discussions, etc.) or by user/type (e.g. Instructor, Mobile, etc.) and are formatted as easy to navigate and mostly image-based walk thru demonstrations of how to use a particular feature. Best practice tip? Share relevant Student Guides in your Canvas course to help students be more successful in using Canvas. Canvas Live provides free webinar trainings on a variety of best practices with teaching and learning on Canvas topics. Join a live session or if you can’t make it sessions are archived for later viewing. MCC Center for Teaching & Learning How-To Documents include a variety of helpful how-to guides such as the Getting Started with Canvas in 10 Steps resource. [Student Resource] MCC Canvas101 is an open enrollment, self-paced course that introduces students to Canvas and walks them through the basics of setting user preferences, submitting assignments, replying to discussions, taking quizzes, viewing grades and more! Recommended for all students. Contact the MCC Center for Teaching & Learning for all your Canvas questions. We are here to help! When sending emails or leaving voice messages, please be as specific as possible about your request. Include your name (first and last), the course section number (if applicable) and a brief description of the issue within your inquiry. This will help us address your question faster! Outside normal business hours students should contact the 24X7 assistance line at 1-888-994-4433. An unexpected change in the way Canvas handles user email addresses may have an impact on the sending and receiving messages using standard email. Specifically, when replying to a message that was received in an email account Canvas is now verifying that the email address of the sender matches the preferred contact information provided by that user within Notifications. If they do not match, this may lead to messages being bounced back as undeliverable. What this means is that if you reply to a Canvas message from your Maricopa Gmail, with one of your email aliases (MEID@mesacc.edu) that does not match the email address that you have used to set up Notifications in Canvas (first.name@mesacc.edu), that message will not be delivered. Option 1: If you are electing to route your Canvas messages to your Employee Gmail be sure to add your MEID@mesacc.edu account to your preferred contact methods in Canvas and adjust your Notifications for receiving messages accordingly to this account. Option 2: Within Employee Gmail, remember to select the appropriate alias when replying to a Canvas message. For example, if your preferred contact email address within Canvas is first.name@mesacc.edu then when replying to a message in Gmail select this alias from the “From” field. Note: If you are using an email app from a mobile device, you may not have the ability to change the “From” address when you reply. Option 3: Streamline your communications by only replying to messages within Canvas. Use Notifications sent to email to alert you to messages to manage in Canvas. The advantage of this option is that you will only have one account to manage and the common issues with routing of messages will be avoided. Spring 2014 and older SIS courses (courses with a designated section number) will begin being deleted the third week in September. All course materials and student information associated with those courses will be deleted. These courses will also no longer appear in your course menu, inbox or calendar list. Canvas launched an updated Community feature for users in April. The Community is a resource for students and instructors to find helpful guides on how to use Canvas, as well as to participate in feature discussions, find best practices and more. All the links to old Canvas Guides will remain functional, however, we recommend moving any support links you provide to students to the new community guides as the old guides will no longer be updated. Update Cycle Canvas is on a 3-week update-release cycle. The next beta (preview) release is on 9/8, production notes will follow on 9/14 with the release and documentation to follow on 9/19. Follow the release schedule on the Canvas Updates Calendar. Groups will have you seeing seeing double the awesome! Canvas allows for student group work either independently of assignments (study groups) or within the Assignment or Discussion features (group projects, activities, etc.). Moving students from groups caused a variety of issues once student work for that assignment had been submitted. In this latest update, Canvas has added a warning to instructors if they try to modify a group set that has existing student submissions. Instructors can choose to modify the group, or they can clone the existing group set. Learn more about Groups in Canvas. Remove or add a student to a group for a future assignment without having to redo the group set-up or disrupting grading. Cloning a group set will copy the entire group set, including all groups, group leaders, and memberships; instructors can then make changes. 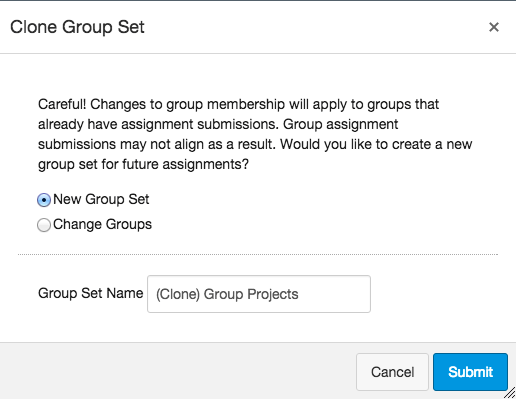 Group sets can also be cloned at any time in the Settings menu for the group set. When assessing web links (URLs) submitted in the SpeedGrader, a new link will appear to open the submission in a new tab. Learn more about the SpeedGrader. Canvas has improved the accuracy of the displayed time even if a user’s computer browser and Canvas profile are set in different time zones, Canvas will display the profile time zone in a user’s account settings. Learn more about User Settings. Instructure, the makers of Canvas, are committed to creating a learning environment for all users. Canvas is built on modern coding technologies and is dedicated to meeting web accessibility guidelines. Learn about the basic accessibility features of Canvas or review the Canvas Voluntary Product Accessibility Template to more deeply understand Canvas’ conformance with the accessibility standards under Section 508 of the Rehabilitation Act. Although Canvas is constantly striving to meet and improve upon its accessibility, this does not guarantee that a course is accessible. Only we can ensure the accessibility of the content we place in Canvas. Keep it simple and clean. 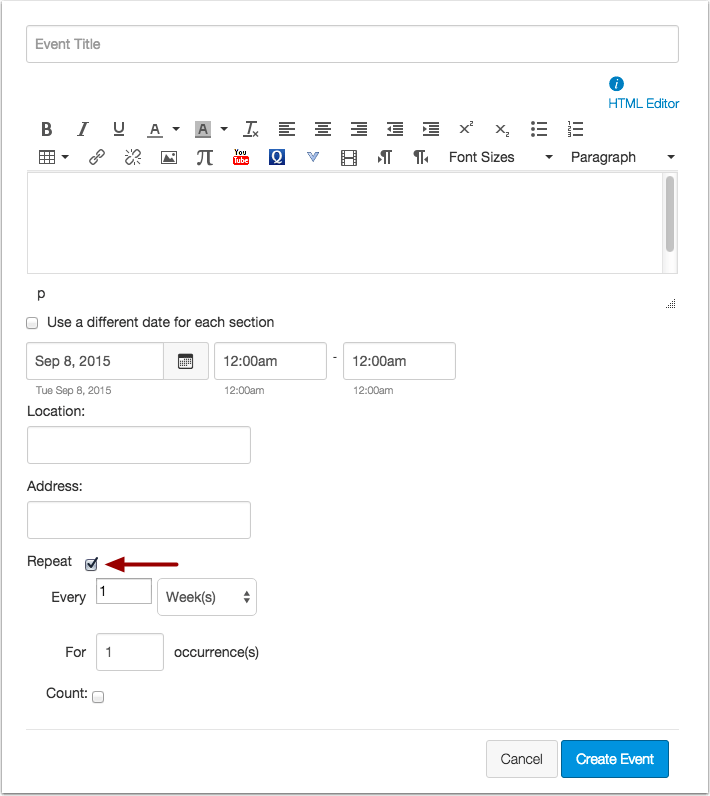 Chunk information and use the descriptive header styles built in to the Rich Content Editor. When using color font, select high contrast options. Use the WAVE Tool to check your text-based content for accessibility. Alternative (alt) text is required to provide a text alternative to non-text content or images in web pages and digital files. Embed images in Canvas to provide a descriptive text that will be read to those using a screen reader. Learn how to embed images in the Rich Content Editor. Ditch the “click here” or pasted web address links for descriptive words that link to a web URL. This will help all users understand where a link will go before they click on it. Learn more about descriptive links. All videos should be captioned and a transcript alternative available for audio podcasts. Videos uploaded to Canvas can be captioned by the built in resource Amara. Learn how to create captions for new or uploaded Canvas videos. Verify that MS Word, PowerPoint, PDF and other non-native files to Canvas pass accessibility guidelines. For MS Office, use the accessibility checker utility to quickly scan and correct errors or learn how to create accessible PDF documents. Read more about the latest accessibility and Feature enhancements in the Canvas Product Release Notes. General accessibility design guidelines can be found in the General Design Guidelines for Accessibility guide for Canvas. The MCC Course Accessibility Checklist is a quick and helpful assessment tool to help you audit your course for accessibility. The MCC Disability Resource Services – Faculty & Staff Resources page can help you understand the process of making accommodations for learners. Contact the MCC Center for Teaching & Learning for more information about accessibility. Canvas Live provides free webinar trainings on a variety of best practices with teaching and learning on Canvas topics. Join a live session or if you can’t make it .” target=”_blank”>sessions are archived for later viewing. MCCCD Canvas Help Area provides how-to documents, and support information to all Canvas users, students and faculty. The CIS 236 and CIS 237 series is designed to help you get started in or retool for the unique world of teaching & learning in the hybrid and online formats. It can also help support you in web-enabling your ground/face-to-face course. First, experience the ‘student’ perspective of online learning in CIS236. Get helpful tips to facilitate a course including policies, procedures and content management (copyright and accessibility). Along the way, see what the Canvas learning management system can do to enhance any course format and discover new digital teaching tools to engage learners. Then explore course design and content creation more deeply in CIS 237. Build engaging assignments, group activities and integrate technology to support learners’ needs. Instructors will complete the series with practical tips, researched pedagogy and a duplicative structure for building and facilitating an online or hybrid format class or supporting a ground/face-to-face course with an online presence. Mesa Community College is offering CIS236 and CIS237 in the Open Entry format for the Fall 2015. Experience using a web-based learning environment from an online student’s perspective. Use communication tools, submit assignments, use evaluation tools, and navigate an online-learning environment. Introduction to the basics of online pedagogy and lots of hands-on experience with a web-based learning environment and digital teaching tools! Prerequisites: CIS133CA or CIS 133DA, or permission of instructor. Contact instructor for override code. Offered fully online during Fall 2015 (Open Entry) – Choose a start date between August 24 and October 16. Students will have 8 weeks to finish the course from the start date. Discuss theories, methods, and best practices for designing, developing, and delivering an online course including Classroom Assessment Techniques, Flipped Classroom, Quality Matters and more. Create an online or hybrid course module using a web-based learning environment. Prerequisites: CIS 236, or permission of instructor. Contact instructor for concurrent enrollment code (allowing students to take CIS236 and CIS237 simultaneously). Make sure you are ready for a smooth start this Fall 2015! Access your courses quickly and easily by customizing your Course Menu in Canvas. Remove Spring 2015 and older classes from your list so that you can focus just on the current semester. Check your All Course List in Canvas. Verify that you have been officially scheduled as the ‘instructor on record’ in SIS (My.Maricopa). Instructors assigned to courses in SIS will have access to a Canvas shell. Is your course non-credit? Only credit courses are provided Canvas shells. To request a Canvas shell for a non-credit course, contact the MCC CTL at (480) 461-7331. If your course is still is not listed (after following the steps above), contact the MCC CTL at (480) 461-7331 for assistance. You don’t have to start from scratch! Copy an entire course or select items that you want to copy from a previous course into your Fall course shell. 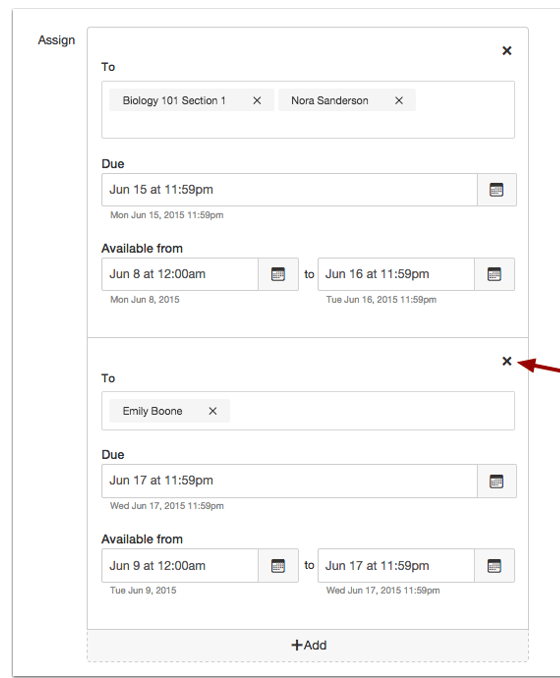 Don’t forget to use the Adjust Events and Due Dates option to save yourself time. Please note it can take up to 2 hours for copies of courses from one semester to another to be completed (size and traffic determine speed). Feel free to leave the copy page or logout of Canvas while the copy is being made. Additionally, pay close attention to any error notices at the end of the copy process. Review any alerts reported (posted notice in the import history) and take corrective action. Errors will most often be related to broken links or empty pages. Please review the import (copy) guidelines to get started. Publish any quizzes, assignments, discussions, content pages or modules that should be visible to students prior to publishing your course. Publishing the course will not publish items within the course that are still in ‘draft state’. Learn more about Draft State in this short video. Don’t forget to publish your course to make it available to students. Once a course is published you can continue to make changes and updates as needed. Courses cannot be unpublished once students have submitted work to the course. Do you want to combine two or more sections of the same class? Combining sections can be a great option for more easily managing courses of the same prefix/# and type (in-person, hybrid or online). When you cross-list all the students will be have access to and participate in a single Canvas course. This does not change the SIS enrollment. Learn more about cross-listing sections in Canvas. Update Cycle Canvas is on a 3-week update-release cycle. The next beta (preview) release is on 8/17, production notes will follow on 8/24 with the release and documentation to follow on 8/29. Follow the release schedule on the Canvas Updates Calendar. As needed, you can use the Gradebook to excuse a student from an assignment, discussion, or quiz. You can also excuse a student from a group assignment. 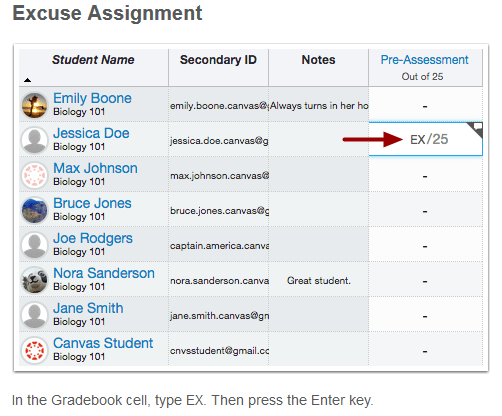 When an assignment is excused, the assignment page and the student grade page will show the student that he or she has been excused from the assignment. Students cannot submit excused assignments and they are not calculated as part of a student’s total grade. Learn more about Excused Assignments. Using Differentiated Assignments you can create Assignments, Graded Discussions, and Quizzes for certain only a individual student(s), sections, or vary due dates for students in your courses. Honor’s & Special Projects – Assign special projects to only the students that need to complete this work. Make-Up Work – When a student misses a class you can assign them an individual alternative assignment. Varied Due Dates – Creating assignments for different users also allows for different due dates and availability date options for the same assignment. Great for cross-listing (combining) sections that meet on different days of the week. When using differentiated assignments with the Gradebook, the assignment appears as a column for all students, but grade cells are grayed out for students who have not been included in the assignment. On the student grades page, students can only view assignments that have been assigned to them. Grades cannot be assigned for students who have not been included in the assignment, and assignments that are assigned to them, either individually or as part of a course or section, are not factored into overall grades. Learn more about Differentiated Assignments. The student Submit Assignment link has been moved out of the sidebar and placed more prominently as a (blue) button. The Re-submit Assignment link has also been re-purposed as a button. Instructors can allow students to indicate ‘liked’ discussion replies within Canvas Discussions (graded and ungraded types) on a per-discussion basis. When a discussion has liking enabled, students and instructors will see a gray Like icon within each discussion reply. When clicked, the icon will turn blued indicating that the discussion reply is ‘liked’. A total number of likes will appear next to the link and optionally instructors can elect to have replies with the most ‘likes’ appear at the top of the board. The ‘like’ feature may also be limited to instructor use. Learn more about the Like feature in discussions. Just in case you missed it in late April Canvas released the first iteration of Anonymous Peer Review. 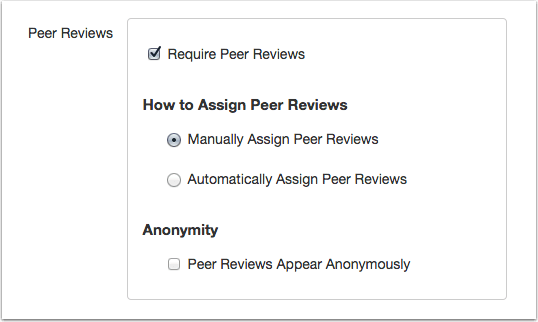 Instructors can now choose to create peer reviews (for Assignments and Discussions) with anonymous responses. This hides the name of the student reviewer from the student with the submission. Note: Instructors will always be able to see the name of the reviewer. Canvas plans on adding more functionality to the peer review feature in the future. Stay-tuned! Learn more about Anonymous Peer Review. Canvas now allows users to set their own colors for each calendar in their account. Users can select from one of 15 default colors or insert a Hex code to create any color of their choice. Colors selected by instructors for a course calendar do not effect the student view of the calendar. Learn more about the calendar. Etherpad is no longer available as an option for class collaboration within Canvas. All existing Etherpad collaborations have been deleted. If you are interested in using collaborative documents in Canvas you have the option to use Google Docs or Pages. 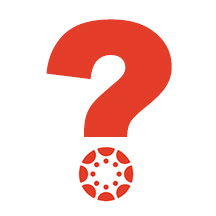 A new Quiz icon will display in the Gradebook when students complete a quiz that includes a manually graded question. When students hover over the icon, students can view a message indicating that grading is in progress. Learn more about Gradebook icons. A new Module Requirement feature option allows instructors to assign ‘Mark as Done’ for students to progress through course assignments and pages. When this is enabled, students are responsible for marking the module item as done before they can move on to the next module item. Learn more about Module Requirements. The Canvas File cabinet has been completely overhauled making it easier to upload, organize and view files. The new interface for files includes creation and modification dates, file sizes, publishing options and more. Learn more about using Course Files. When rearranging and resizing columns in the Gradebook for ease of grading, the changes will now persist or remain in place across computers and browsers. Note: changes to the Gradebook in the instructor view does not change the student view. Learn more about customizing Gradebook. What’s New in Canvas? Personalized & Social Learning! Tuesday, August 11, 3:30 p.m. – 4:30 p.m.
Thursday, August 13, 9:00 a.m. – 10:00 a.m.
Monday, August 17, 4:00 p.m. – 5:00 p.m.
Help is Just a Click or Call Away! Contact the MCC Center for Teaching & Learning for all your Canvas questions at ctl@mesacc.edu OR (480) 461-7331. We are here to help! When sending emails, please be as specific as possible about your request. Include your name (first and last), the course section number (if applicable) and a brief description of the issue within your inquiry. This will help us address your question faster! How do students get help with Canvas? Students seeking assistance with Canvas should contact the MCC HelpCenter at: (480) 461-7217 OR HelpCenter@mesacc.edu. Outside normal business hours students should contact the 24X7 assistance line at 1-888-994-4433. Get a jump on your course design with the MCC Getting Started Module. This “Start Here” module includes everything you need to get students going in Canvas and in your course. The duplicative and customizable template includes a home page, welcome letter, syllabus sample, links to important student resources, Canvas tutorials, sample introductory activities and much, much more. This module was designed by the MCC eLearning Committee (according to Quality Matters standards) and can be used with any course format. Preview & Download the MCC Getting Started Module Template into your course today! Many textbook companies offer a variety of instructor resources that can be can be used outside or within Canvas to supplement your content. Resources range from presentations and test banks to fully integrated applications with assignments and grade books. Talk to your publisher representative to find out what types of materials are available and get an access account. Cartridges are the most convenient option for loading large amounts of publisher resources into Canvas. If your publisher offers an integration with Canvas, ask for a demo course so you can see how the integration might work for your course and decide whether you would rather keep the systems separate. Note: Security and privacy issues may have to be addressed for any integration of publisher systems with Canvas. Contact the MCC CTL for details. How can the MCC CTL help? The MCC Center for Teaching & Learning does not have direct access to publisher information and resources for textbooks. We can act as a consultant to help you in finding your publisher representative, reviewing the resource options available to you and your students, helping you download and upload course materials, and assisting you in integrating special publisher tools. The CTL is your partner as you implement innovative teaching, learning and workplace strategies. From general support, to consultation services, and/or tailored workshops, we are here to help you, your department, program or team reach your goals for student success. The CTL provides day-to-day support for faculty and staff on technology, teaching and productivity issues including Canvas. Stop by our offices, send us an email or give us a call for support or to set-up an appointment. We are here for you! Fall is Almost Here! Are you ready to Inspire Learning? The Mesa Community College Center for Teaching & Learning is offering a variety of learning opportunities this fall. Attend these informative and hands-on sessions that will help you discover the best in teaching and learning through Canvas, build a foundation for success from day one and engage students in a vibrant and universal classroom community. Get ready to inspire learning this fall at MCC! View the full Fall 2015 Start-Up Guide Book. Check our calendar for updates. CTL sessions use HRMS (Time & Labor) for our registration system. The system allows for an up-to-date attendance system that integrates with your employee record and allows for wait-lists for busy sessions. Each opportunity has a unique course and session number to make it easy to identify and register for. Please feel free to contact us, ctl@mesacc.edu, if you have any questions or concerns about how to register with this system. 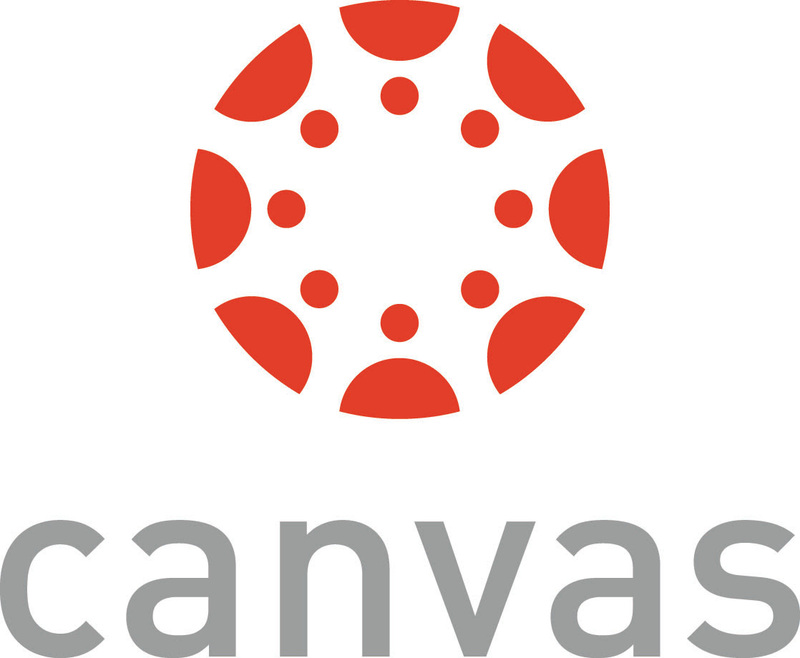 Canvas is the Learning Management System of choice at the Maricopa Community College District. Did you know that Canvas can benefit any course format – face-to-face, hybrid and online? Learn how to communicate with your students, post course materials/ syllabus, set-up assignments and grades within Canvas in just 10 easy steps. Great for anyone interested in teaching and learning with Canvas. Monday, August 10, 10:30 a.m. – 12:30 p.m.
Tuesday, August 11, 9:00 a.m. – 11:00 a.m.
Thursday, August 13, 3:00 p.m. – 5:00 p.m. In this hands-on session participants will get a brief introduction to Grades (SpeedGrader and Crocodoc), Rubrics, Discussions, Quizzes, and the Assignments features in Canvas including strategies on how to use them effectively to assess and provide feedback on student work. Review the options available in Canvas to help you know how well your students are learning in your courses. Great for new Canvas users or those interested in learning more about the assessment features. Tuesday, August 11, 1:00 p.m. – 2:30 p.m. Explore the new features and updates to our learning management system, Canvas. From Differentiated Assignments to the New Community and “Liking” Discussions to Anonymous Peer Review, join us for a session dedicated to all things new in Canvas! Great for current Canvas users or new users looking to review Canvas features. (Note: Not a getting started session). “Have you tried turning it on and off again? Have you switched browsers? Are you sure it is plugged-in?” If you have found yourself asking any of these questions then you know that one of the many roles we play as faculty is that of technical support. In this session we will explore ways to acclimate students to the Canvas LMS through orchestrated activities, relevant resources and clear/salient instructions. Walk away with tools, tips and tricks to be a Canvas Genius! Great for current Canvas users or new users looking to review Canvas features. (Note: Not a getting started session). Wednesday, August 12, 3:30 p.m. – 4:30 p.m. Communicating with students can be a challenge. In this session participants will learn how leverage Canvas as powerful tool for more effective and streamlined communication. First, learn how to send, receive and manage messages in Canvas using the Conversation Inbox & Notifications. Then widen your scope by incorporating Announcements, Discussion, Chat and more! There are just so many ways to say “good communication” in Canvas. Great for new users or those looking to review the communication tools in Canvas. Thursday, August 13, 1:00 p.m. – 2:30 p.m.
Ready to start measuring the MCC 4Cs or learning objectives in general? Discover how Canvas Outcomes allows faculty to enter institutional outcomes, course competencies and learning objectives to monitor student academic progress. Participants will learn to enter Outcomes and then align and grade Assessments (Quizzes, Assignments and graded Discussions) using rubrics. The session will also review the MCC’s 4C’s Scoring Guidelines and discuss effective practice for connecting and monitoring these outcomes. Great for current Canvas users or new users looking to review Canvas features. (Note: Not a getting started session). Thursday, August 20, 3:30 p.m. – 5:00 p.m. Attend this session to have hands-on assistance in using the MCCCD Google Mail and Calendar systems. Learn the basics to effectively communicate and organize your work schedule! Great for new employees and those looking for a refresher on the MCCCD Mail & Calendar systems. Monday, August 10, 3:00 p.m. – 5:00 p.m.
Wednesday, August 12, 9:00 a.m. – 11:00 a.m.
Make your course more accessible with just a few simple best practices. In this session participants will view our accessibility resource for faculty and the WAVE Tool for checking online resources. Discover ways to make your course user friendly for all your students using universal design techniques. Great for all faculty. Wednesday, August 12, 11:30 a.m. – 12:30 p.m.
Friday, August 21, 1:00 p.m. – 2:00 p.m. In this session we will explore how to construct a syllabus that not only conveys the required MCCCD/MCC policies and procedures of the class, but introduces students to the goals of the learning process in an engaging way. Discover how to build an interactive syllabus that focuses on meaningful expectations, learning objectives and provides students with the resources to be successful from day one. Great for all faculty. Friday, August 14, 9:00 a.m. – 11:00 a.m.
Friday, August 21, 2:30 p.m. – 4:30 p.m.
Online learning systems and education technology tools have made it easier for us to be efficient in teaching and learning. Using auto-feedback features, and systematic announcements we can manage our classes and our learners to maximize our output. But what is the net effect of this efficiency model? In this session we will discuss facilitation and design practices that can re-humanize our courses to both strengthen the learning community and increase student success and retention. Great for all faculty. Monday, August 17, 9:00 a.m. – 10:30 a.m. The first few weeks of class can be rough for students. In this session we will explore a simple model that will help reveal dropout warning signs while learning proactive intervention strategies. Discover how you can collect and review key Data indicators, Develop an engaging community and use Dialog (communication/feedback) to keep all your students on the path to completion. Great for all faculty. Friday, August 21, 10:30 a.m. – 11:30 a.m. The MCC Getting Started Module is designed to provide Mesa Community College faculty with the basic elements necessary to effectively welcome students to a course and connect them with valuable resources. Based on the Quality Matters rubric and the work of the MCC eLearning Committee, this module is a duplicative template that contains best practice ideas, resources and activities for a variety of course formats and needs. Come to this informative session to review the module and learn how to modify it for your course(s). Great for all faculty. Friday, August 14, 11:30 a.m. – 12:30 p.m.
Monday, August 17, 2:30 p.m. – 3:30 p.m. Looking for assistance with video? Look no further. Come to this session to see our new MCC Video Toolbox, carefully packed with everything you need to create stunning and content rich videos that will help your learners reach their educational goals. Great for all faculty interested in video production. Monday, August 17, 11:00 a.m. – 12:00 p.m.
Join MCC’s Dean of Student Services, Meredith Warner, as she discusses behavior assessment inside (and outside) the classroom and Disability Resource Services at the college. Through real-MCC examples participants will learn about the diversity of student concerns and needs on our campus. Walk away with hands on tools to more effectively manage your classroom and ensure the safety of all learners while helping them reach their educational goals. Great for all faculty. Monday, August 17, 1:00 p.m. – 2:00 p.m.
Adobe Connect is the premier resource for online live classroom and web conferencing solutions for eLearning and business applications and it is now available at MCC! Adobe Connect’s comprehensive product provides a safe platform for virtual real-time instructional and non-instructional presentations with features such as: screen and file sharing, video/audio capture, mobile device support, session recording, live polling and more! Learn more about Adobe Connect features, best use cases and how to request a session. Great for faculty and staff interested in live conferencing. Friday, August 21, 9:00 a.m. – 10:00 a.m.
New Adjunct Faculty Orientation is designed to welcome new Adjunct Faculty to teaching at Mesa Community College. Orientation includes a welcome by President Dr. Pan and Interim Vice President of Academic Affairs Dr. Yohe. This session will cover all the little and big things you need to know about being an Adjunct Faculty Member. Don’t miss the opportunity to meet fellow faculty members, discover success strategies for starting the semester off right (including syllabi creation), and learn about the crucial support systems available to you and your students at MCC. Saturday, August 15, 8:00 a.m. – 12:00 p.m.
A new space and a new face for Professional Development opportunities at the MCC Center for Teaching & Learning. Stop by to learn about our services including the new Professional Development request process where we help connect you to learning opportunities that will meet your needs. Discover how we can create tailor-made self-help materials/references, custom sessions/workshops and provide consultation services for your program or project. It’s all here! It’s your CTL! Drop in during any time of the open lab to access resources and help with Canvas or building/planning your course! CTL Staff will be available to answer questions as you work on your classes to get started for the semester. Handouts and computers are available so that you can come in and work and ask questions as you go. Monday, August 17, 9:00 a.m. – 4:00 p.m.
Friday, August 21, 9:00 a.m. – 4:00 p.m.
Monday, August 31, 9:00 a.m. – 3:00 p.m.
Thursday, September 3, 9:00 a.m. – 3:00 p.m. Questions? Call the CTL 1-7331. For a full description of the sessions visit the CTL Calendar, ctl.mesacc.edu/events/calendar. Thank you for registering for the Mesa Community College Center for Teaching & Learning 6th Annual CampInnovate event. The event is just a few days away. We are looking forward to seeing you at your respective sessions Tuesday, May 26 – May 28 at the MCC Southern and Dobson Campus. So air out your tent and grab your gear to participate around the campfire of innovative teaching and learning! You will receive individual email reminders for each of your sessions, but you can also review your requested sessions by visiting the HRMS Time & Labor System. After you log-in with your MEID and MEID Password, follow this path, Main Menu > Self-Service > Learning & Development > Training Summary to review your sessions. See the Full Week Guide for a day-to-day listing and description of all events. We have created a special campsite (Canvas Self-Enroll Course) just for you! In this course you will find general information about camp, pre-camp activities, session information/resources, session evaluations, online campactivities and more! Presenters will place all session resources and content into this guide throughout the week. We hope that you utilize this course to find resource, interact with fellow participants! Don’t Forget to Complete the Pre-Camp Activities! All Camping Sessions will be hosted in the AS Building; Southern & Dobson Campus in the Center for Teaching & Learning (Room AS175). We recommend that you leave your camper in the Northwest Parking Lot (Lot A) which is closest to the AS Building. No! We won’t actually be camping. Just bring you and maybe a friend or two to enjoy the learning and community. Light provisions will be provided each day and at the Celebration Event Celebration on Thursday, May 28, 4:00 – 5:00pm. RSVP for the celebration. Bring a Friend to Camp! All MCCCD faculty and staff are welcome. Please encourage a friend to join us at camp! Space is limited, so tell them to register soon. Note: Registration is through HRMS Time & Labor. “Campers” can earn digital badges for participating in sessions, bringing guests, submitting ideas/projects and evaluating the event. These digital badges can be added to your professional portfolio, Linked-In profile and more. Learn more about using digital badges in education. The MCC Center for Teaching & Learning will track and award badges based on the individual badge criteria. Additional Badges may be awarded throughout the campfor submitting camp assignments, participating in campfire chats and more. These activities are located in the special camping site (Canvas Self-Enroll Course). Please note, pictures will be taken throughout the week and by attending the event you authorize the Maricopa Community Colleges to photograph or video you and to use the photographs or videos for educational or promotional purposes. In order to ensure a smooth, end of the semester, please consider following the best practice activities for closing your course and transitioning to the next semester. Check Your Grading – Ensure that student grades are tabulating correctly. Check your grading options including any assignment groups and grade weighting (if applicable) from Assignments in the course navigation. Enter zeroes for any student work not submitted OR from Grades select the “gear” drop-down menu, click “Treat Ungraded as 0’s” to ensure unsubmitted assignments are scored with a zero. Detailed instructions. Incomplete Grades – Do not conclude your course or lock modules if you have assigned a grade of “Incomplete” to a student. They still need to access and participate in the course material. Accessing Course Data – Withdrawn student data, downloading of assignment data, and sending of messages is not available after final grades have been entered in My.Maricopa.edu (SIS). Instructions for accessing grades in Canvas after conclusion. To reduce the quantity of old courses on the server, Spring 2014 and older SIS courses will begin being deleted the 3rd week in September, 2015. This will be the first in a regular cycle of course deletions that will occur every semester throughout the district. Beginning the 3rd week of September courses from Spring 2014 and later will no longer be available for you to access. All course materials and student information associated with those courses will be deleted. These courses will also no longer appear in your course menu, inbox or calendar list. Begin exporting your old Canvas courses. Even if you rollover your course from semester-to-semester, we recommend that you retain a copy of any of your courses that will be deleted, as the export file can be imported into another Canvas course at a later time. Note: A course export does not include student records. Student grades and work (those you want to retain beyond the life of the course) should be downloaded at the end of each semester (review the instructions included later in this announcement). Note: Student discussion posts cannot be bulk downloaded, but can be printed to PDF. Contact the CTL for details. Once the initial course deletions are finished, you can expect five (5) semesters of courses to be retained at any one time. Plan each semester to export your course content and download student records to make sure you always have a back-up of important course information. What about records retention and dispute of grades? The deletion plan meets the records retention policy of the district and state of Arizona. MCCCD’s official policy on records and information management. 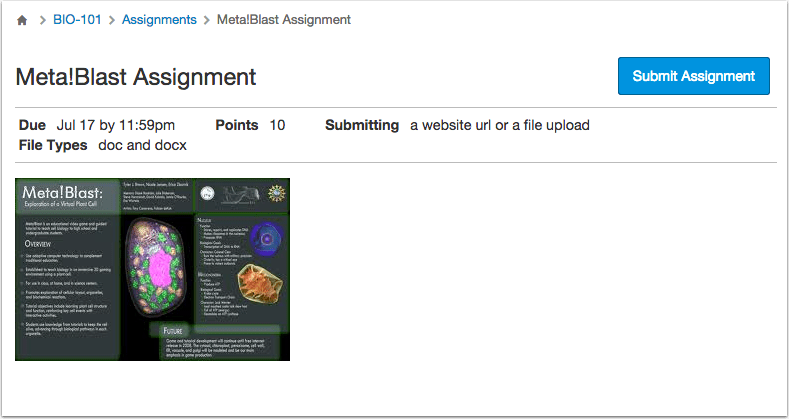 For Assignments: Click on Assignments > Select Download Submissions from the right-navigation. More Information – Downloading AssignmentsSend Final Communications – Send end-of-course messages to students, if desired. Please note that all communication will be preserved in the Canvas Conversations inbox. Export Your Course Content – Export your course content and save it locally on your computer or flash drive. Settings > Export Course Content. Note: A course export does not include student records (discussion posts, assignment submissions, grades, etc.). End Course – You can leave your course “as is” and it will automatically go into a read-only mode for students. Students will no longer be able to submit assignments or communicate with the class. If you prefer, you can also end your course (Settings > Edit Course Details > Enter an Ending Date for the course). More information on course dates. We DO NOT recommend concluding your course as it becomes inaccessible to you. Locking Content – You can selectively lock content to keep students from accessing sensitive content such as quiz results. If you do not want students to view Quiz Questions after the end of a semester you will need to set and ending date for your course. Click on Settings > Edit Course Details > Enter an Ending Date for the course. More information on course dates. For Course Files, hide the Files area from the course navigation. Keep in mind that files linked to pages will still be visible unless locked. Locking Files Instructions. Update Your Canvas Links – Canvas has launched an updated Community feature for users. This change means that any current web links to Canvas Guides will no longer work after June 30. If you have linked to Canvas materials to help students do or access something in your course related to Canvas, you will need to update those links to the new community resources. This includes any college provided information (such as the Getting Started modules, course templates, etc.) that links to Canvas guides. The NEW links to the commonly used Canvas Guides can be found at the CTL LMS Tutorials page. Course Copy – Get ready for Summer and Fall 2015 by copying your course content from Spring or other course shells. To get started, navigate to the Summer or Fall 2015 course, open Settings and then follow the Course Copy Instructions. Clean Your Inbox – Archive your Spring messages in your Conversation Inbox so that you can start the Summer/Fall semester(s) with a clean slate. Archiving Conversations. Customize Your Course Menu – Remove your Spring 2015 classes from and add your Summer and Fall 2015 courses to your course drop-down menu. Customize Course Menu. Other Notes – We also recommend updating all your browsers, components and clearing your browser cache before beginning a new semester. Contact the Center for Teaching & Learning at ctl@mesacc.edu or (480) 461-7331. 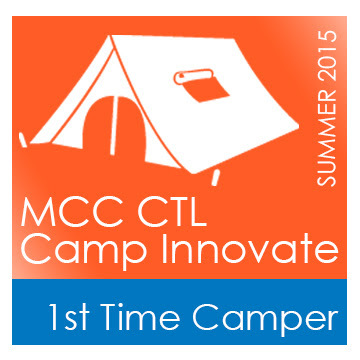 Register Now for MCC’s Camp Innovate May 26 – May 28! The Mesa Community College Center for Teaching & Learning will be holding its 6th Annual Camp Innovate event Tuesday, May 26 – Thursday, May 28 on the MCC Southern and Dobson Campus. So air out your tent and grab your gear to participate around the campfire of innovative teaching and learning! Camp Innovate is a week of sessions and engaging activities offered every summer at the MCC Center for Teaching & Learning that address excellence in education, technology, teaching and learning. Visit the Camp web site for more information. Watch highlights from the 5th Annual Camp Innovate Event. Event topics will include Accessibility/Captioning, Digital Tools, Video Production, Lesson Design, Virtual Reality, Broadcasting, Copyright, Canvas and more! See the full week Camping Guide for a day-to-day listing and description of events. New this year! Introducing Rise & Shine (8-8:45am) and Smore-Sized (12-12:45pm) sessions! Join us over chow time for these engaging 45-minute demonstrations of emerging technologies and/or quick “best practice” tips that can maximize your instructional impact and activate learning. Light provisions (refreshments) will be served. Camp Sessions will be hosted in the AS Building; Southern & Dobson Campus. All MCCCD faculty and staff are welcome. Attend one session, attend one day or attend all, we hope to see you there! Registration will open soon. Stay-tuned in! No! We won’t actually be camping. Just bring you and maybe a friend or two to enjoy the learning and community. Send us an email at ctl@mesacc.edu.